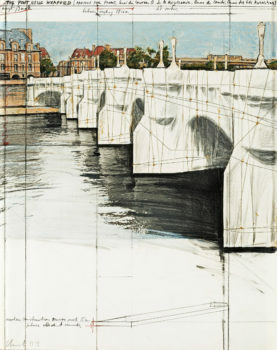 CHRISTO & JEANNE-CLAUDE, The Pont Neuf wrapped (Project for Paris), quai du Louvre, Q. de la Messagerie, Ile de la Cité, Q. de Conti, Q. des Gds. Signed Christo and dated 1979. Collage on panel, pencil, charchoal, fabric, pastel e.a. Mounted in plexi box, 72 x 56.5 cm. Christo Javacheff is born in Gabrovo, Bulgaria on June 13th 1935 to a family of entrepreneurial origins. From 1953 to 1956 he concludes his studies at Academy of Fine Arts in Sofia. In 1956 he stays in Prague for six months and the next year completes a semester at Academy of Fine Arts in Vienna. In 1958 he is much better off after moving to Paris, where he meets Jeanne-Claude Denat de Guillebon who becomes his wife in the same year. His first works date back to this period, like ‘Packages’ and ‘Wrapped Objects’. In 1961 he starts a collaboration with his wife Jeanne-Claude and brings to life two creation of his which will become legendary: ‘Projet d’un edifice public empaqueté’ (i.e. the first project of packing a public building) and ‘Stacked Oil Barrels’ (i.e. the stacking of thousands of oil barrels in Cologne Harbour). In 1964 Christo and Jeanne-Claude move to New York. In 1966 they realize ‘Air Package’, i.e. an air package in suspension and ‘Wrapped Tree’, i.e. a tree packed by Stedelijk Van Abbemuseum in Eindhoven, Holland. In the next years several works are brought to life, such as ‘Wrapped Roman Wall’, i.e. the draping of a portion of ancient Aurelian walls and of a Roman gate: ‘The Pont Neuf Wrapped’, which is the draping of the most ancient and unique double bridge on Seine in Paris (40.876 square metres of interwoven polyamide and 13km of rope). In spite of all that, ‘The Umbrellas’ remains the most important work, especially due to the time it takes to completion: about 7 years, from 1984 to 1991, as it is necessary to install 1340 blue beach-umbrellas in Ibaraki, Japan and another 1760 yellow beach-umbrellas in California, USA; each umbrella is 6 metres tall and 8.7 metres wide. In 1992 Christo ventures on a project never completed to this day: ‘Over the River’, i.e. the proposal of covering a 11 km portion of Arkansas River in Colorado with a succession of cloth panels supported by steel wires. The latest work dates back to 2005 and is called “The Gates”: it’s an installation, in Central Park in New York, of a foot-path signaled by 7503 doors at a constant distance from which coloured curtains hang at a height of 2 metres. All in all, Christo and Jeanne-Claude are two unique artists who through their works “unveil by concealing”, opening human imagination and concealing or emphasizing original content for a short period of time. Their art can be best described as emphasizing by concealing, as proposing a never-before-experienced perception of reality.